Moving into 2019, a shadow of uncertainty looms over the Chinese and world economy. It was the most discussed topic at the 2019 Boao Forum for Asia (BFA) last week in South China’s Hainan Province. 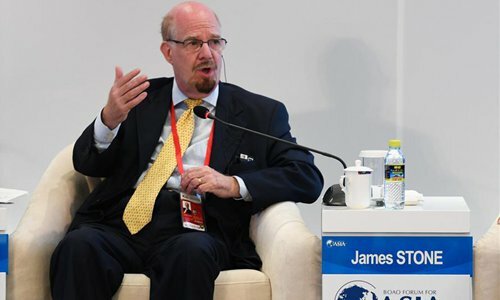 On the sidelines of the BFA, Global Times sat down with James Stone (Stone), founder and CEO of Plymouth Rock Assurance Corporation and former chairman of the US Commodity Futures Trading Commission, to try and gain a better understanding of the future direction of both economies. The conversation also provides insights on the China-US trade talks and China’s financial opening-up. GT: What is your view on the world’s economic trend and where are we now? Do you think the world economy is moving up or down? Stone: I think the world economy at this point is pretty strong for the next 10-year period, largely because of ongoing tremendous advances in technology. When my father was born, there wasn’t a telephone. When I was born, we didn’t have a television. But now every year something new replaces the old. The race is very fast now. And it’s spurring a great economic growth period. There are issues to face in the long run as a result, particularly with environmental issues. It’s not one hundred percent clear the world economy can continue to grow at the current rate indefinitely, with overconsumption of natural resources and pollution. Suppose someone could invent a machine that pulled everything out of the ground and made it into something immediately. If we then used it all and then threw it away in one year, we would increase the gross national product (GNP) of the world many hundred-fold. But the next year we would be broke. So, we need to measure goals more comprehensively than simply by annual GNP growth. But if you are asking me only about GNP growth, the next 10 years look pretty good for the world. GT: What do you think about the Chinese economy? Will it keep the same momentum? Stone: Simple mathematics says that it is easier to have percentage increases from a low base. So China’s percentage increases will be hard to maintain. But I don’t see any slowing if measured in absolute terms rather than percentage terms. China appears to be in a very strong position. I don’t see any apparent challenges that would cause the Chinese economy to hit a wall. GT: What’s your perspective on the China-US trade war? Is there going to be a deal? If so, what kind of deal it would be? Stone: I have the view that nations, most of the time, will do what is in their national interest. Every once in a while, nations get into tragic conflicts that are destructive to both sides. But most of the time, they can find ways to serve their national interests through negotiations. I don’t like the phrase “trade war” in use today. A war is an attempt to destroy an enemy. In this situation there is no desire on either side to destroy the other. Let’s just call these “trade tensions.” While the negotiations are proving to take longer, and are harder, than I thought, I will still predict that it is so plainly in the interest of both countries to make a deal, and that a deal will soon be made. So, yes, I’m optimistic. One thing that will help is that 20 years ago China did not have a lot of cutting-edge intellectual property. It needed to reach out for the intellectual property of the rest of the world so it could develop its own. Now, China’s motivation is different. It has plenty of its own intellectual property to protect. So I think intellectual property is becoming a much easier issue on which to find common ground between China and the US. GT: How do you see China’s new round of opening-up, especially in the financial sector? Stone: An open market economy is always going to be more prosperous. I don’t think anyone really doubts that. It’s clear that as China has become more open, it has become a major force in the world economy, and that freer trade has made the country more prosperous. The financial sector is a complicated one, though, for any economy. We have a financial excess problem in the US. It was only a few decades ago when the US financial sector took about 9 percent of all profits. Now, it takes over 30 percent. I think that is too much. With too many speculations and too much leverage, you risk panics. So, nations have to be careful when opening the financial sectors. An unregulated financial sector can be a mistake. The industry and society benefit from sensible balanced regulation. You can’t have complete laissez faire in finance. It’s good for restrictions to be loosened here for overseas investments and good that a derivative market will be developed here. But you’ll want to be cautious. Those useful derivatives can be dangerous if not properly limited because they increase leverage more than any other kind of financial instrument. China should move toward derivatives but not toward excess.